You have to think that Douglas Carswell must be very confident of taking the seat for UKIP for him to have stood down in the first place. He’s in a part of the world which is demographically quite UKIP friendly and the party did very well in local council elections. 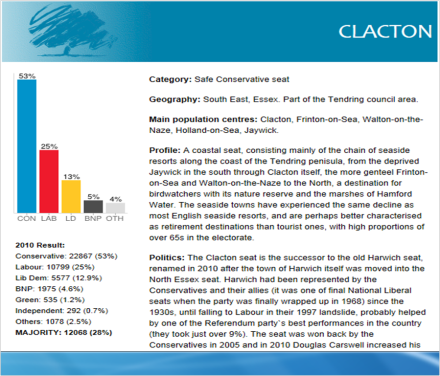 This will be a hugely demoralising blow for the local Conservative party and, despite a twelve thousand plus majority, we think that Carswell’s personal standing makes him a strong favourite. It’s certainly possible that Labour could sneak this by mopping up some of the Lib Dem vote and hoping that UKIP and the Tories split down the middle. However, we thought the same about Newark and they put in a fairly woeful display there. I wouldn’t say that we saw this coming, but a few people had some small bets on Carswell to be next UKIP leader in the last week – his odds had gone from 100/1 to 33/1 even before this news; he’s 2/1 favourite now. 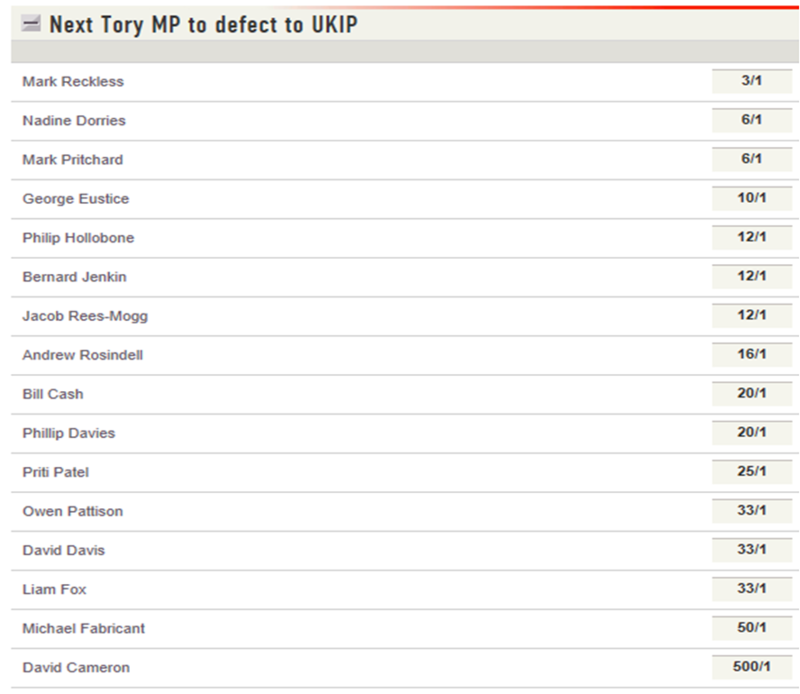 We’d also taken some money from informed sources on UKIP to win Clacton at the general election at 20/1. I don’t think they were guessing. We’ve cut the odds on UKIP winning a seat anywhere in the UK at the general election from 4/6 to 1/3. We’ve also quoted 6/4 that any other Tory MP defects before the general election. Nadine Dorries and Mark Reckless are a couple of names that spring to mind.